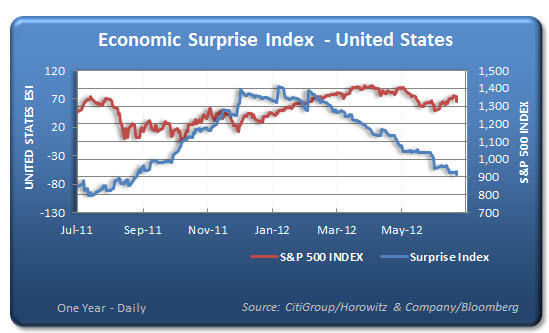 We have looked at the Citi Economic Surprise Index before as it has some merit as a forward indicator for stocks. Looking at the first chart below, notice how the index is sloping down recently. Often times, equity markets will take time to move in the same direction with a bit of a lag. The reason is that it takes time for investors to change their opinion and believe that there is a change occurring. There correlation is not exact, but the reasoning that poor economic condition, worse than expectations will show up in equity valuations make sense. Below is a longer-term look at the CSI and the S&P 500. 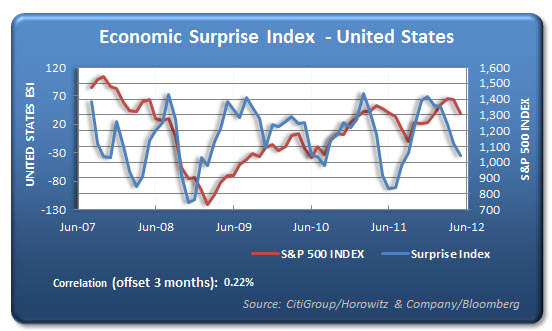 So far, stocks have remained resilient ahead of the deteriorating economics.